Hauser and Wirth’s new exhibition Turning Inwards presents sculptures and works on paper made by the artist Louise Bourgeois in the latter years of her life. The show opens with one of Bourgeois’ enormous bronze spiders lurking malevolently in the gallery’s dimly lit converted barn. Surprisingly, the rustic setting compliments the piece and makes for a perfect lair. The etching that is hung in the corner of the space is appropriately titled ‘The Nest’, and this depicts a ghastly kind of tunnel made from spider-like structures that adds to the sinister feeling of the room. 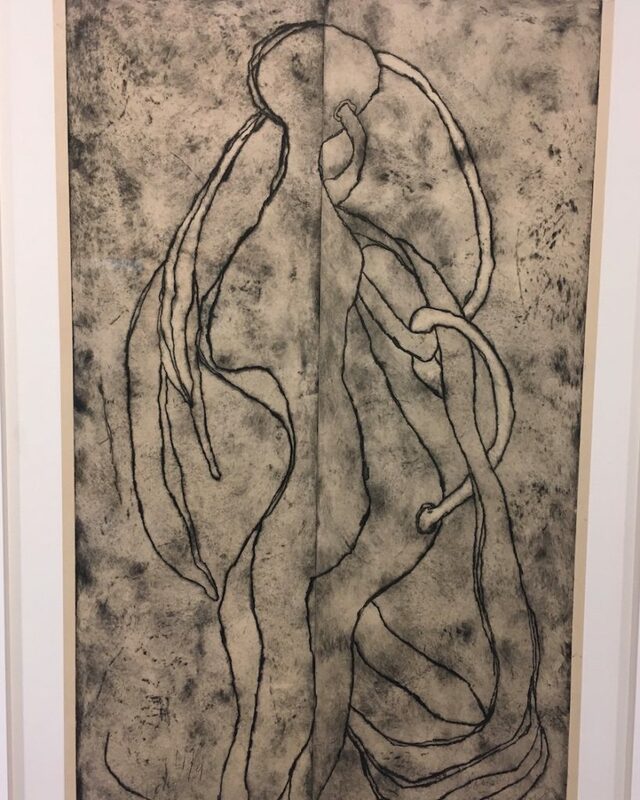 All the etchings in the exhibition were made in the last four years of Bourgeois’ life and demonstrate the sheer energy and physical power of the artist even at such an old age. The strange, ambiguous imagery in the work also conveys this sense of frantic energy. The etchings are fraught with discomfort and anxiety. Many have the appearance of DNA or molecular structures. One work titled ‘Incognito’—in the room next to the spider’s lair—could be anything from a supernova to an image of insect egg sacs grouped together. The exhibition’s largest space has an immense impact. The walls are covered with large etchings which include a series of organic shapes that could be read as female reproductive organs—as they so often are. One piece which has layering and overlapping leaves is suggestively called ‘The Smell of Eucalyptus’. The shapes are not only organic but also sinisterly feminine. The frank titles of the work often contain a tone of bitterness and resentment, especially regarding themes of maternity and reproduction. Most of the prints are long and rectangular in shape depicting towering cellular structures. Some flicker with small notes of colour while others are built up in vivid aquatic greens and blues and textured with thick white paint. Many of these tall wobbling structures, several of which are appropriately called ‘Look Up!’, seem to be climbing their way to the sky. A number of pieces demonstrate Bourgeois’s career-long habit of twisting domestic scenes and spaces. One installation called ‘My Blue Sky’ provides a view of a surreal landscape through the broken, dirty glass of a window from the artist’s apartment in New York. The outer world appears to be like a wonderful fantasy land seen through the bars of a derelict prison. The work shifts classic architectural scenes and images and moves them into a more sinister environment. Traditional feminine subject matter is transformed into something frightening. One work called “I See You!! !” appears to depict the back of a woman’s head with a ring of pearls round her neck, but the shape is also like that of a vase or hourglass. Her womanly curves are filled with a sea of ominous bulging eyes. The female body is made to become something frightening or alienating. One disturbing etching depicts the figure of a woman with a bulging, possibly pregnant, stomach which has a tube coming out of it that seems to be intricately connected to another attached to her mouth. Bourgeois artfully twists the natural biological processes of life into disturbing, unnatural images. There appears to be a lack of control in the powerful energy of the work and it provides a visceral reminder of one’s inability to control or understand oneself or the functions and abilities of our own bodies. Overall not a comfortable or a pleasurable experience but certainly a powerful and unforgettable one. The exhibition runs until the 1st of January 2017. 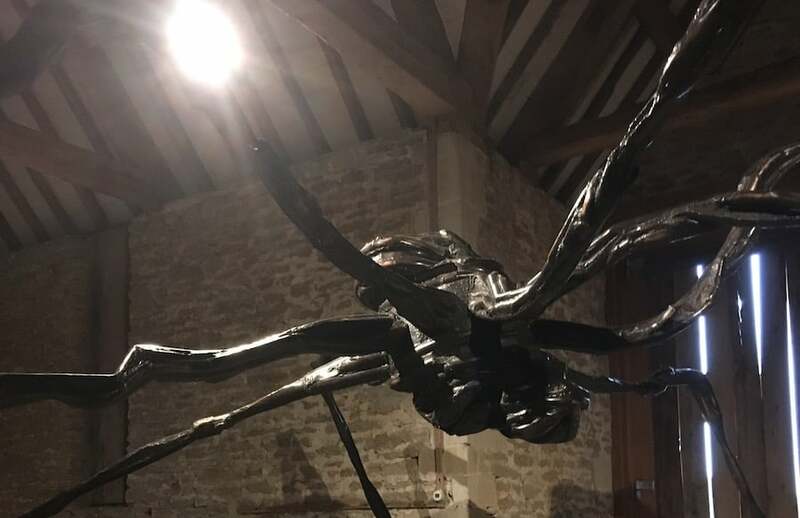 The show opens with one of Bourgeois’ enormous bronze spiders lurking malevolently in the gallery’s dimly lit converted barn. The shapes are not only organic but also sinisterly feminine.